The first page in my affirmation journal created with a laser printer transfer, marker and watercolor. I have been wanting to experiment with transferring a laser printer image into a journal using solvents for a while. Since the weather is warmer, and I am able to work outside, I decided to start my newest journal creation, an affirmation journal, using this technique. The Ecosystem sketchbook paper seemed appropriate for this method with its bright white paper. Even though it is not as thick as the paper in a Moleskine sketchbook, it has a more porous surface and I thought it might take a transfer well. 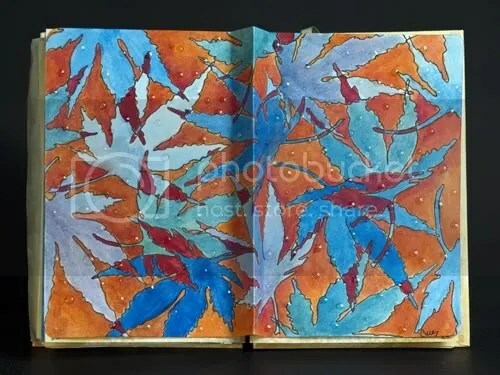 On the first page of this journal I wanted to include a message that would express the overall theme of the journal and I wanted to create it primarily with text. Since my handwriting is awful, I created an illustration in my drawing program that would fit the page. Once I had a design I was happy with, I printed it out backwards, as a mirror image, so the transfer would read correctly when complete. 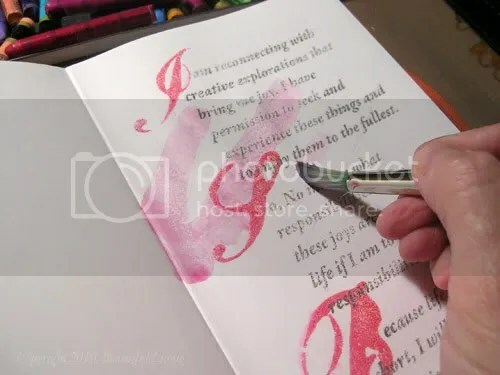 Once I had my laser print out, all I would need to do is place it face down on the journal page and apply a solvent to the back of the print out to dissolve the laser ink so it would print on the journal page. In order for the transfer to read properly on the page, I had to print my image out backwards on my laser printer. I placed this image face-down on the journal page to make the transfer. I used lacquer thinner to make the transfer. It is pretty nasty stuff and should only be used outdoors or in a well ventilated area. This substance is not for everyone and if you are chemically sensitive, I would recommend that you avoid this technique. I blotted the solvent on the backside of the laser print until I could clearly see the image below. I used a fair amount of pressure to be sure I was making good contact with the journal page. In some areas, I burnished the image while the paper was still damp for a stronger transfer. Once the solvent dries, the wet areas disappear. To check my progress, I carefully lifted the paper to see how the transfer was being applied. I was careful to hold the paper in place to keep it lined up with the image. 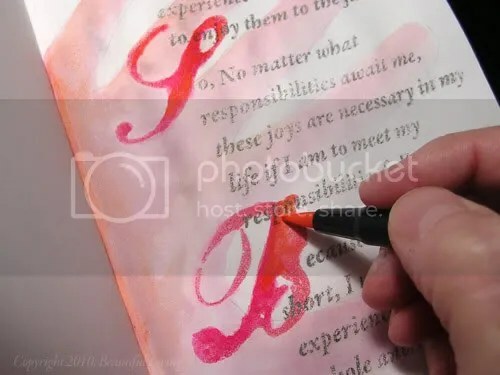 When making the transfer, I applied the solvent using a paper towel and blotted the back of the paper until I could see the image clearly through the back. I found that burnishing the image while the solvent was still damp improved the depth of color. I did this slowly and checked my work frequently by lifting the laser print to see how well the transfer was being applied. I added watercolor and marker to the transfer to complete the image. 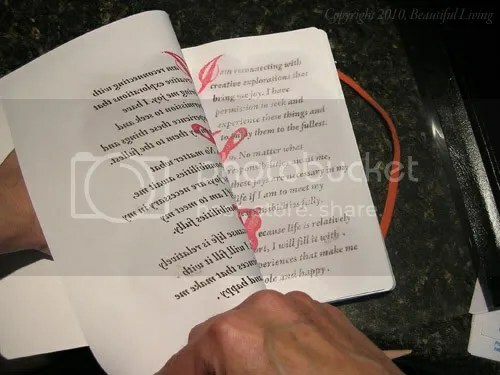 Once the transfer was complete, I added a watercolor silhouette of my hand to relate to the hand on the cover and provide a subtle transition to the interior pages. This caused the paper to buckle a bit, but I did expect this since the paper is sketch paper and not watercolor paper. You can see the cover image I created in an earlier post here. To complete the illustration, I darkened the color of the large letters to add color and contrast to the image. I added marker to the large letters for additonal color and contrast. Final transfers using this method will be somewhat fuzzy and will never look as clear as the original. 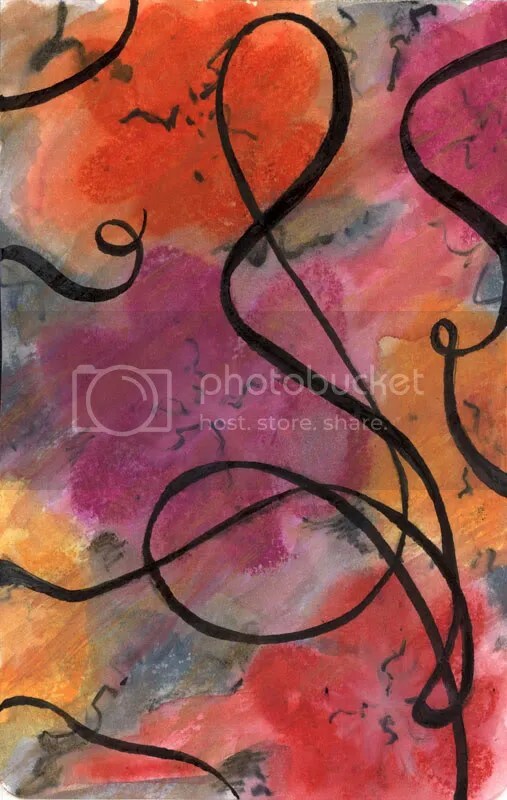 But this can be used to create images that look stamped or aged and adds an interesting effect to your art. It can be combined with other elements to give your designs a unique and professional look, and is worth experimenting with if you are looking for new ways to create art. I reviewed the Fiorentina Journal refill a few weeks ago using pen and ink, but at the same time, I also did a quick test of the most basic art mediums in the journal and wanted to share the results. I tested some of my favorite artist mediums in a lined Fiorentina Journal Refill. The results were better than I expected for a writing journal. 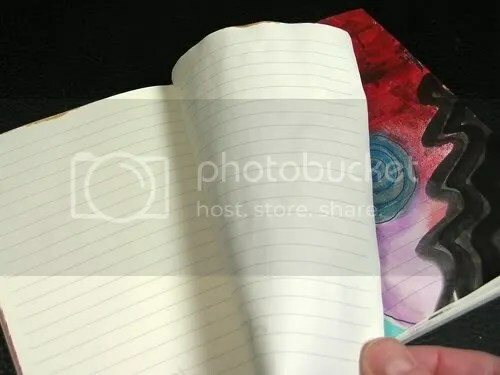 I used the lined journal for the test rather than the sketchbook because there are times when you want to incorporate art into a written journal and it is good to know how well the journal will perform. 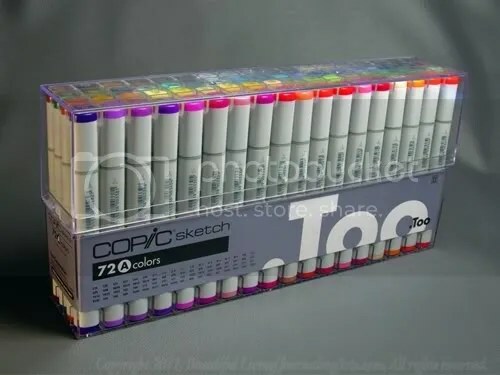 Also, I plan on doing a review of the sketchbook refill at a future date, so this way I can explore both. 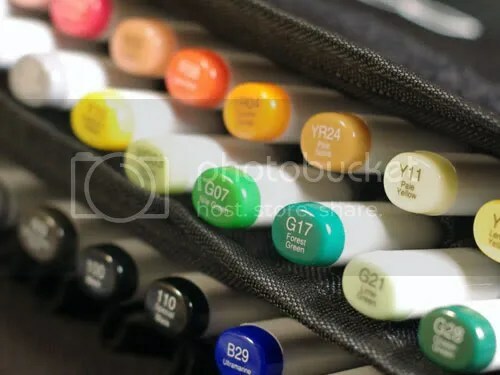 The most basic art supplies were used for the test, including those that are the most portable, to give you an idea of what can be done while you are traveling with your journal. I tested a few others, too, but wanted to focus on those that are easy to carry. 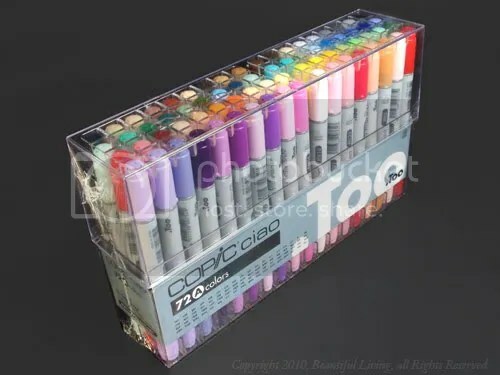 The best performers were the Tombow Dual Brush pens, pen & ink, Sharpie Fine Point Permanent markers and the Prismacolor colored pencils. Each of these mediums went down smoothly without bleed through, show through or paper curl. The colors were clean and clear and the edges were sharp. Most of the mediums performed well and did not bleed thorugh the back side of the page. The wettest paints caused some bubbling of the paper which is visible in the photo above. The paints were overall good performers with only one issue; paper curl and/or bubbling. There was no bleedthrough or showthrough on any of the paints. Watercolor and ink wash caused the most paper distortion, but not nearly as much as I expected. Only the wettest areas bubbled and warped. The acrylic paint caused minor buckling when the color was applied thickly, but this disappeared as the paint dried. 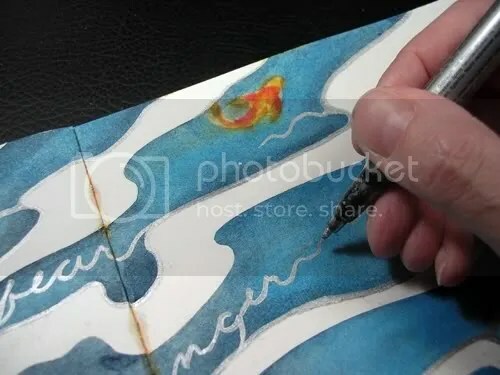 The water-soluble Aquarelles did not cause any paper distortion until water was added. Only the ink from the StazOn ink pad bled through the backside of the paper. This is not surprising since this ink is designed to be used on non-porous surfaces. The only medium that performed poorly was the ink from the StazOn solvent-based ink pad. 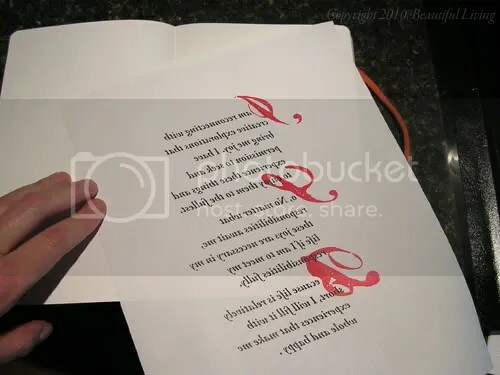 The ink impressed on the page using the ink pad directly as well as from the rubber stamps did bleed through the page. This ink is designed to use on surfaces including plastic, metal, glass, ceramic and leather, so the fact that it bled through paper is no surprise. I would not recommend it for use on paper of any kind unless the bleed though effect is desired. Overall, the lined Fiorentina Journal refill works fine for artist mediums with some limitations. If you limit your mediums to pen and ink, colored pencil, pencil, marker and light paint washes, it will be more than satisfactory. 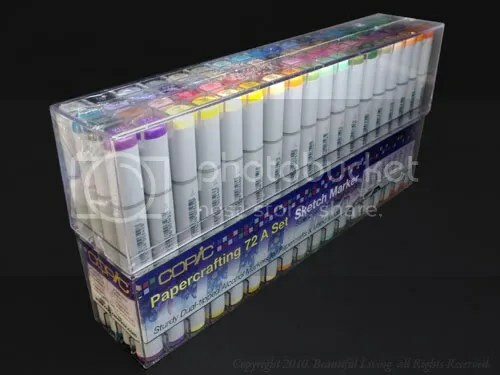 It would not be the best choice for use with wet paints if buckling paper bothers you. 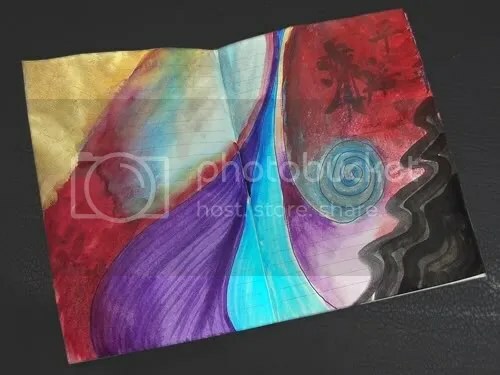 I have heard from many of you who are uncomfortable starting an art journal who are worried that your ideas and first sketches are ugly or unattractive. If you experience this, don’t worry! They all start out that way. An art journal is all about the process and not every page in your journal is destined to be a work of fine art. 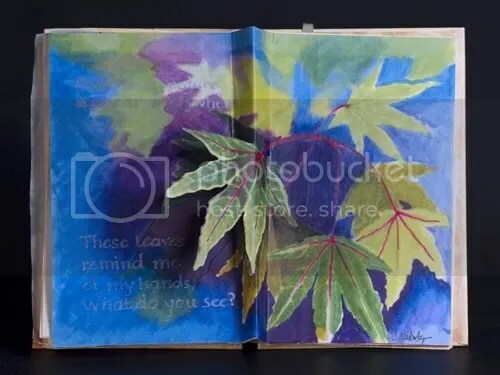 If you focus on the process and forget about the final result, you will enjoy art journaling more and your journals will be filled with unique and interesting art that is meaningful and thought-provoking. I thought it would be interesting to show the steps I take when illustrating a page in my art journal so you could see the process. This 2-page spread is from a journal on abundance I am in the process of working on. 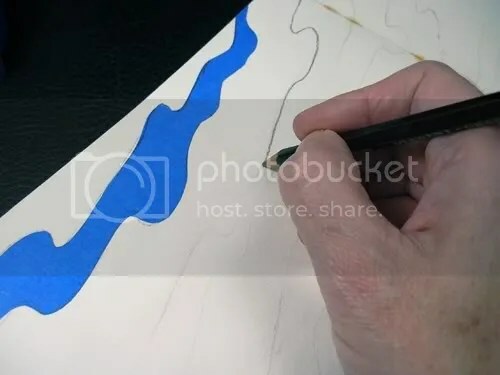 If you compare it to the final illustration at the end of the post, you will find it is only a rough representation of the final image. This is the rough, pencil sketch for the abundance concept. Notice the images and text is loose and incomplete, only there to indicate position. This sketch will be painted over or erased during the process of journaling. It is only a guide that can be changed as the illustration progresses. 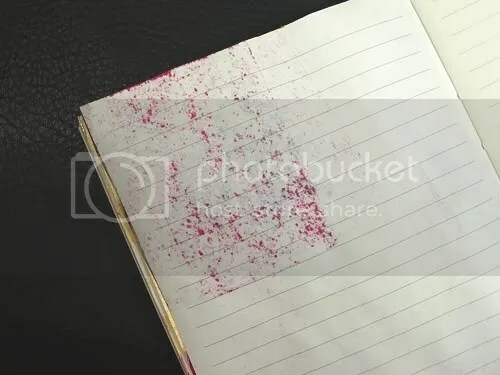 Many beautiful journal pages start as dirty-looking, gray scratchings on the page. In my journal, I started with rough pencil sketches. Notice that these are not perfect little drawings, just basic images and indications of what I see in my head. I used more precise pencil lines as a guide to cut the shape of the reflections from the tape. The lines were dark enough to be visible through the tape. Once the rough sketch was in place, I started to make the pencil lines more detailed. Since I wanted to create glare on the water that would be white in the final piece, I had to find a way to make these areas white. Since I didn’t want to add white paint, I decided to use masking tape to mask the areas I wanted to be white. This protected the paper from paint, creating white areas wherever tape was used. Using the pencil lines as a guide, I cut the tape and removed the tape on areas that were to be painted. Once these areas were taped, I could paint background colors that had a continuous flow, giving a more uniform appearance. You need to exercise care when cutting masking tape that has been place on your paper. If you cut too deep, you could go through the paper or paint might collect in the small cut you made. 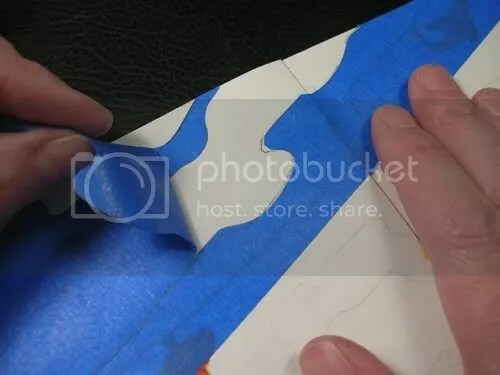 If you are new to this, you might want to practice on a scrap piece of paper to see how much pressure you will need to cut to the correct depth. Removing the tape requires some patience and care. If you are hasty, the surface of the paper will be removed. If this happens, don’t worry, it can be concealed if it causes a problem. In many cases, it is simply not visible in the final product. Use care when removing the tape. If you pull too hard or too fast, you may remove the surface of the paper. The pencil marks can be erased once the tape is removed so they don't show through the paint washes. Once the reflections had been masked, I filled in the background with a blue wash with varied tones. To make it more interesting, I made the lower left corner much darker. This would draw the eye from the lower left into the center of the image where is was much brighter. After the background was dry, I carefully removed the masking tape to reveal the white reflections. I painted the background while the masking tape was in place for a smooth, consistent look. Once the tape was removed, the background and fishes contrast with the white reflections. 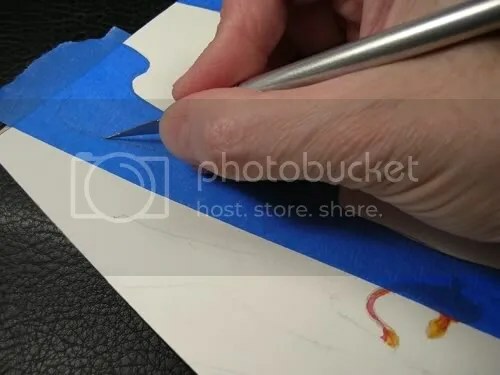 Although I tried to be careful removing the tape, I did manage to pull some of the paper up, but the watercolor paint covered my mistake without a problem, so you really don't notice it. 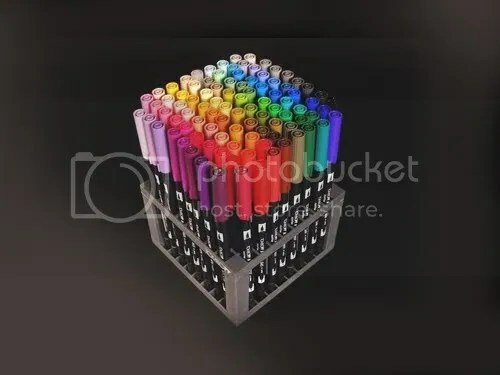 If you right-click the image and choose View Image, you can see a larger version of the image. I used a metallic pen to write the text I had roughed out on the original pencil sketch. I chose metallic pen to simulate the reflections on the water and to give the piece a little bit of flash. I used a cursive text to mimic the shape of the reflections. By doing this, your eye is tricked and it is not obvious at first glance that this is writing. I used metallic pen to simulate the reflections in the water. I didn't want the words to be obvious at first. The cursive style was used to mimic the shape of the reflections. The final art, while far from detailed or visually accurate, communicates the graphic, figurative image I wanted. The final illustration is titled Reflections of Abundance and is just another set of pages in my abundance journal. I like the upward movement and the flow of golden fishes and it encourages me to continue the journey on the next page.